In the southern English town of Woking, a fun fair was evacuated on Saturday evening after a large inflatable slide broke down and at least seven children sustained injuries. They are being treated for "potentially serious injuries." Authorities speak of a "very serious incident." The accident happened around 7.45 pm (local time) at a funfair in Woking, about 35 kilometers southwest of London. A large inflatable slide suddenly collapsed - at least seven children were injured. They have been taken to trauma centers in London where they are being treated. A witness said that an adult was also injured and resuscitated by the emergency services. He claimed that a man and several children fell from the slide. "They were treated next to the slide. I heard the terrible screams of a younger person, who obviously had a lot of pain. " Surrey Police declared afterward: “A number of children fell from the slide and were injured. 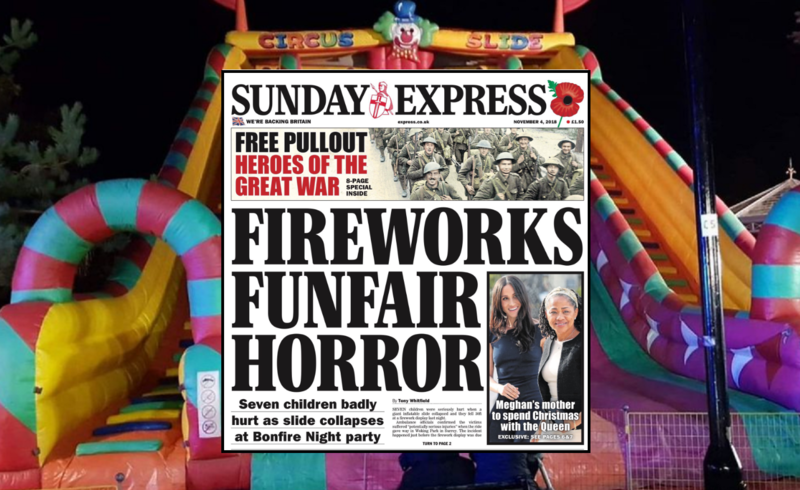 Some 12,000 visitors were expected at the fair on Saturday evening due to a planned fireworks show leading up to Bonfire night on 5 November (when the British remember the night that Guy Fawkes tried to blow up parliament in 1605). Because of the incident, that show was postponed. The fair has since been evacuated.